If you are reading about VVD (VMware Validated Design) first time, this tool helps you to plan, deploy and configure a Software-Defined Data Center (SDDC) in a VMware design experts way. VMware Validated Design is a family of solutions for data center designs that span compute, storage, networking, and management, serving as a blueprint for your Software-Defined Data Center (SDDC) implementation. VMware Validated Designs are tested by VMware to ensure that all components and their individual versions work together, scale, and perform as expected. 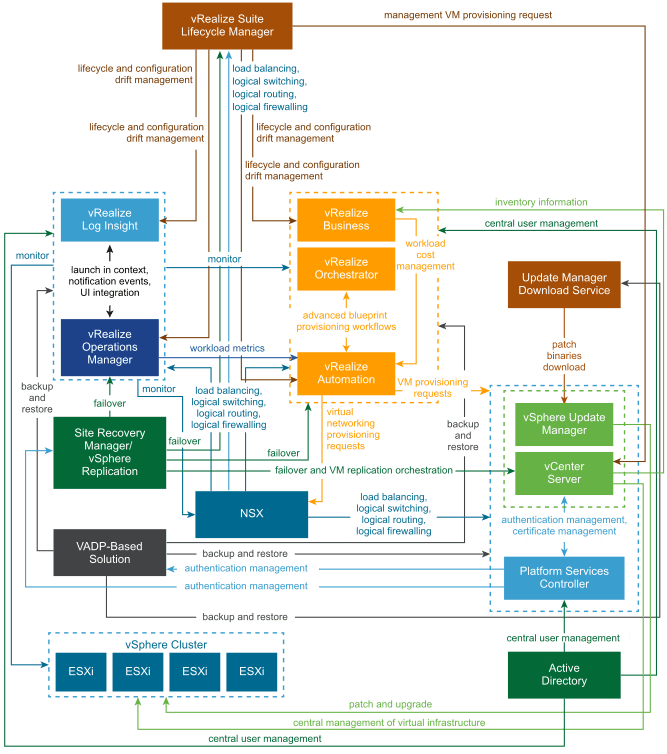 VMware Validated Design is a holistic approach to design, encompassing many products in a full stack for a broad set of use case scenarios in an SDDC. This VMware Validated Design supports a number of use cases and is optimized for integration, expansion, Day-2 operations, as well as future upgrades and updates. VMware provides three implementations of VMware Validated Design for Software-Defined Data Center. 1) The standard implementation of VMware Validated Design for Software-Defined Data Center provides single or dual region data center architecture for an organization’s primary data centers. You can use this implementation a base for additional implementations such as VMware Validated Design for Remote Office and Branch Office (ROBO).2. 2) The ROBO implementation extends the standard implementation to include remote locations that require fewer resources. This implementation is suitable for deployments that are spread out geographically but that you want to manage more centrally. You must have the VMware Validated Design for Software-Defined Data Center primary data centers in place before working with the ROBO implementation. 3) The Consolidated SDDC implementation is an alternative to a single-region VMware Validated Design for Software-Defined Data Center configuration where you use one consolidated pod to run both management and tenant workloads. This implementation is suitable for configurations with lower startup cost and hardware footprint. Standardized, Data Center-level Designs: Standardized, scalable architectures comprehensively tested for integration and interoperability among all the software components in the bill of materials. Proven and Robust Designs: Continuous rigorous interoperability testing validates successful deployment, efficient operations and ensures designs stay valid with subsequent versions of components. Applicable to a Broad Set of Scenarios: A variety of scenario-based architectures – SDDC, IT Automating IT, Intelligent Operations, ROBO – complemented with guidance to achieve IT outcomes delivered by the SDDC. Comprehensive Documentation: Comprehensive set of documents that describe design objectives, architecture design decisions, a software bill of materials, and extensive documentation on how to deploy, integrate and operate the SDDC in a single or dual-region environment.